Are you looking for a fabulous appetizer? This is it! One of my absolute favorites because the Mediterranean flavors are so delicious–but it can be prepared several days ahead, making it so convenient! 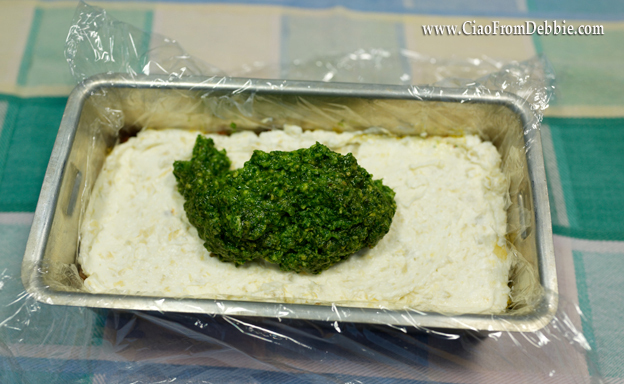 I’ve even made it several weeks ahead and frozen it–then thawing before serving. 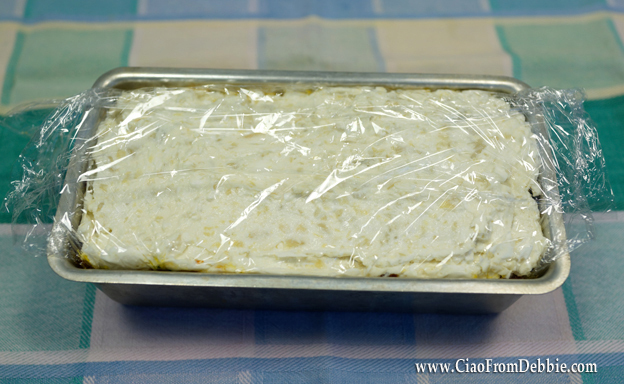 To make it, I first make three different layers of filling…and line a pan with plastic wrap, leaving a good amount of plastic wrap overhanging the pan. Your appetizer can go into the fridge for an hour (it needs some time to set), a day, or five days. I like to bring it to room temperature before unwrapping the top plastic wrap and turning it over onto a platter. The plastic wrap will peel right off, and voila! This delicious appetizer with Mediterranean flavors and Italian colors is ready to enjoy on crackers or thin slices of Italian bread. Don’t feel “locked into” a loaf pan! 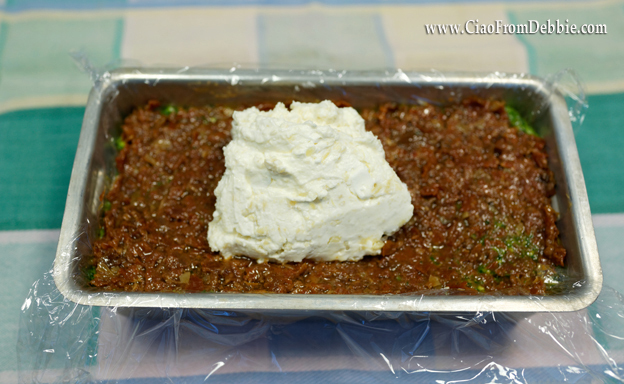 Though it’s a little more difficult to evenly divide up the filling into other shaped pans, try it! I used heart-shaped pans for my daughter’s wedding in keeping with the theme of love. And because the colors also go so well with Christmas, last year I made a number of these appetizers in my large muffin tins putting one on each of the ten tables at our Christmas banquet surrounded by crackers. 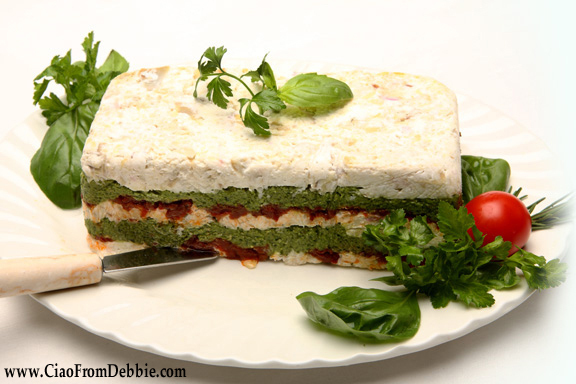 So that’s how to make this delicious Mediterranean appetizer…and here’s the recipe for the three layers. Enjoy! 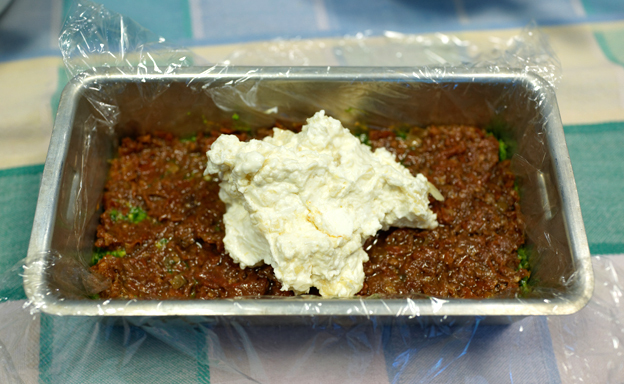 Crumble feta cheese and mix with cream cheese. Add in finely chopped artichokes. Set aside. 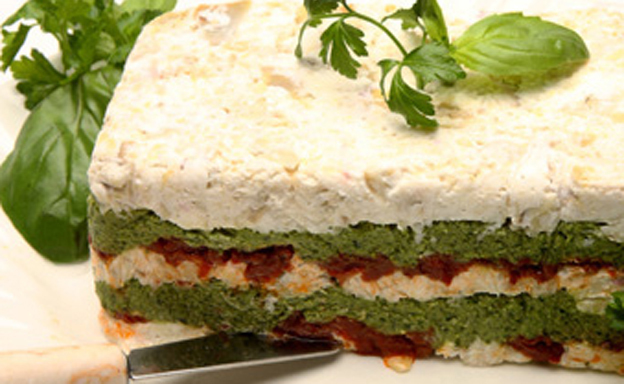 Combine spinach, parsley, basil, garlic, walnuts, and Parmesan in food processor. Process until smooth. Drizzle olive oil in feed tube. Set aside. Chop sun-dried tomatoes–either in a food processor or by hand. 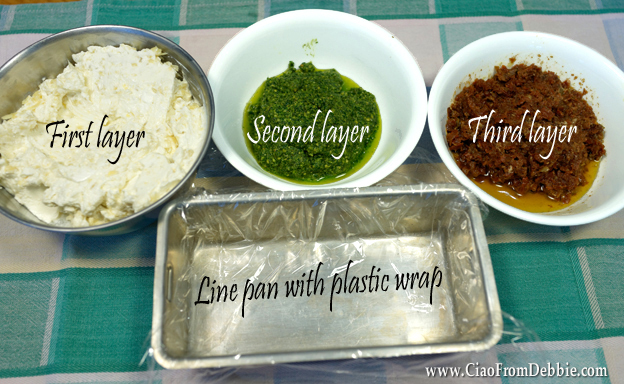 Line loaf pan(s) with plastic wrap, leaving extra wrap hanging over sides. 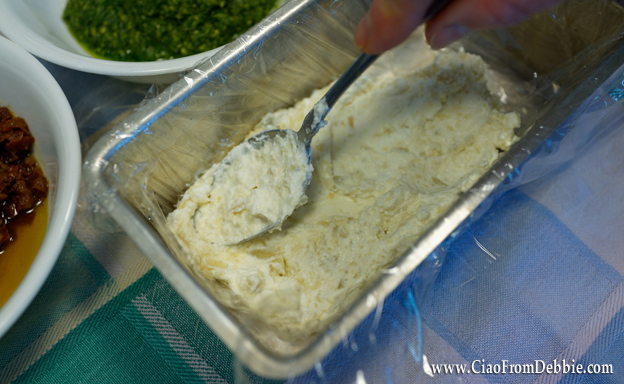 Spread one third of the white mixture evenly over the bottom of the pan. 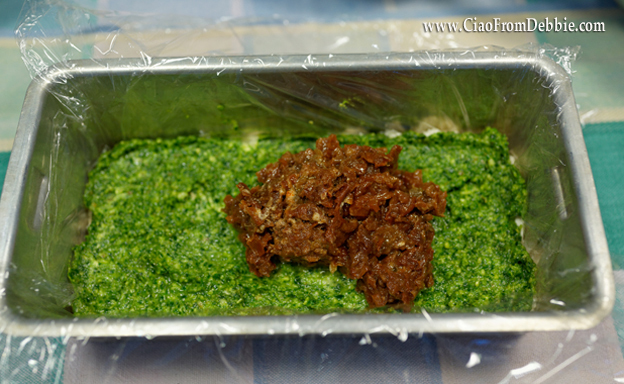 Next, spread half the pesto mixture and arrange a layer of sun-dried tomatoes on top. Repeat layers. 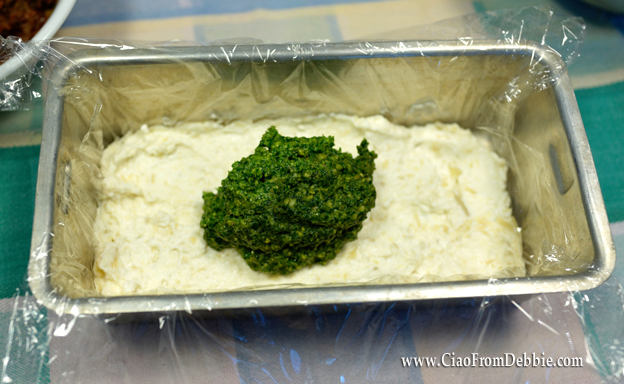 Cover with overhanging plastic wrap and refrigerate at least one hour. You can store in the fridge for up to five days. Invert onto a platter 30 minutes before serving and serve with crackers or bread.